More than fifty members and guests gathered at the Best Western High Point to share ideas for branch projects, changes in the AAUW NC structure, and information from the national organization. In the new structure there are several areas of interest, and the executive committee will be appointing additional board members to fill those slots. Public Policy was an area that got special attention, and a handout on specific North Carolina bills and resources was distributed. No action was taken to make this an official list for AAUW NC, but there was positive feedback on branches “adopting” specific bills and working together to ensure all members have access to timely information on AAUW NC legislative priorities. A team was appointed to look at implementation details. There was a lively discussion of the upcoming AAUW voting — the first in which every member will have a vote. Changes to the bylaws and the public policy program will be on the ballot along with candidates for the 2011-2013 AAUW board. The next issue of Outlook will include full details, and members will be able to vote electronically or by returning their ballot in US Mail. A list of the candidates for the board (15 candidates are running for 10 director-at-large positions) was distributed. Full information on the candidates is available at aauw.org/member_center/1member1vote, and here is a quick list of the candidates and their e-mail addresses if you’d like to ask specific questions. 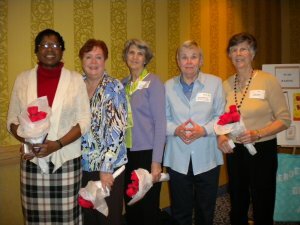 Note that AAUW NC past president Millie Hoffler-Foushee is running for re-election to the board. AAUW Director-at-Large Dave Kirkwood addressed the group over lunch. He updated us on many items from the national organization. He has posted his slides. Nora Hanagan’s handout on Jane Addams.